My friends Gerry and John met me for dinner last night at the Spring Mill Cafe in Conshohocken, PA. This quaint French country restaurant is slightly off the beaten path in the shadow of the Schuylkill Expressway. When I arrived, my wine drinking friends were halfway through their traditional pre-dinner cigar, ensconced in chairs outside the restaurant and sipping an Aussie shiraz as they puffed. As usual, I passed on the smoke and joined in the wine. I was the tie-breaking vote on this wine which was deemed drinkable, if not memorable. Once the cigars were extinguished, we moved inside for our meal. The building housing the Spring Mill Cafe was originally built as a General Store in 1831 which was slightly before John and my time although we think Gerry might have been a youngster and visited the General Store way back then. The present restaurant began in 1978 and has been serving French Provincial food to satisfied diners for the past 30 years. 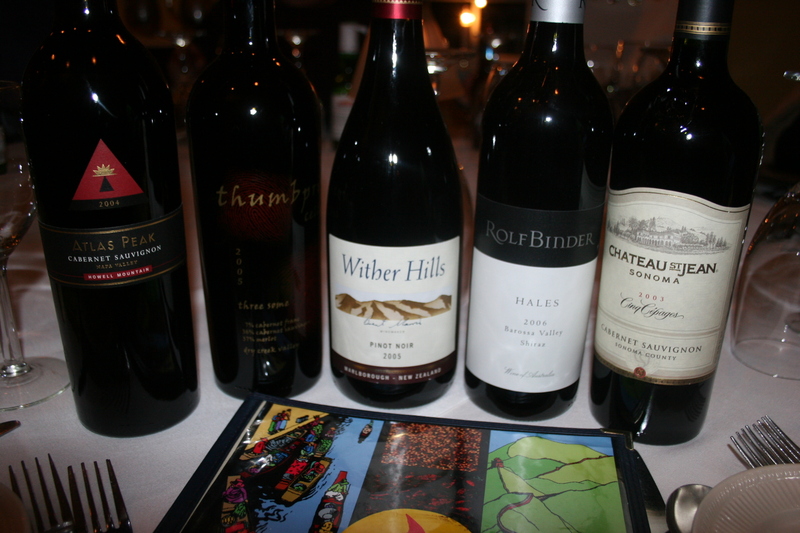 I forgot to take pictures of the food as I was focused on our wines for the evening. I will say, Gerry had the pate “sampler” and John had the escargot for appetizers. I passed on those and ordered the duck. Wait, let me say that correctly, Gerry and I ordered the Magret de Canard Asiatique, seared boneless duck breast with grilled shrimp and an orange ginger beurre blanc with black rice and bok choy. It was kinda like Paris meets Beijing on your palate. The duck was cooked nicely and the black rice and bok choy were nice compliments to the dish. John had the Filet Maison and thought it was excellent. Chef-owner, Michele Haines, who has been at the Spring House Cafe since its inception, was away on a trip to France. Her staff did a fine job in her absence. For dessert I had the Creme Caramel and I believe Gerry and John had ice cream or a sorbet. My Creme Caramel was good but I felt the caramel sauce was a bit weak and watery and a slightly thicker offering would have improved the delicious custard-like treat. 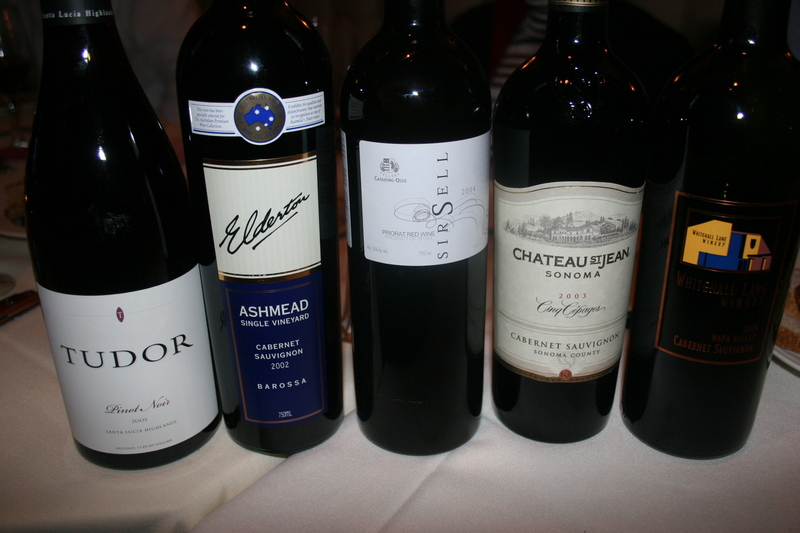 Our wines for the evening were all very good to excellent. 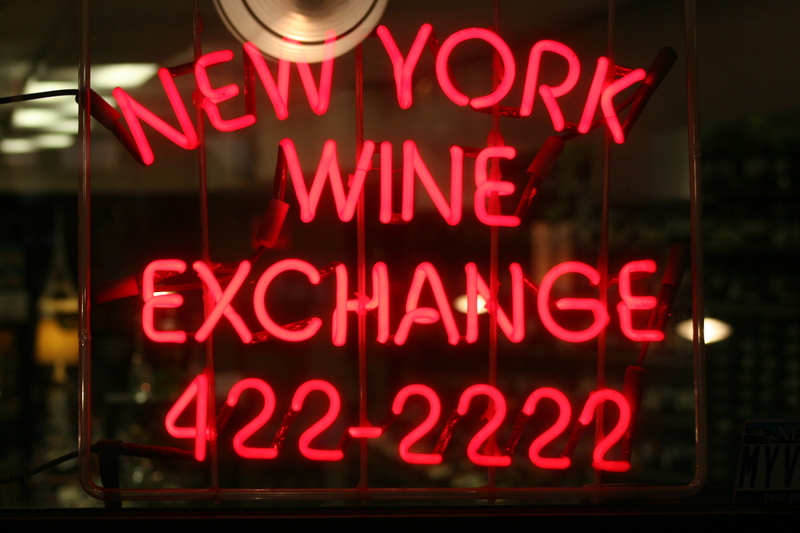 I have to confess that for one of the few times I was completely lost as to three of our wines. They were Chairmen’s Selections from the PLCB State Stores as both Gerry and John are from the Philly side of the river. Here is what we had for the evening. 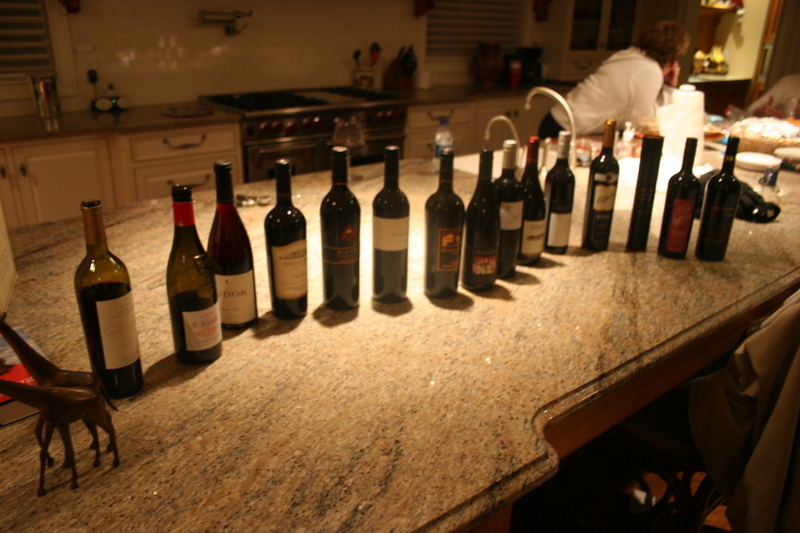 The lineup included from left to right, a 2005 Syan Cabernet Sauvignon from Pyrenees, Victoria, Australia. I have not had a lot of Aussie cabs but if this was representative then I better get moving. Lots of dark berry flavors and a smooth lingering finish. Parker gave barrel samples of this one 91-93 and now that it is bottled the 93 seems just about right. 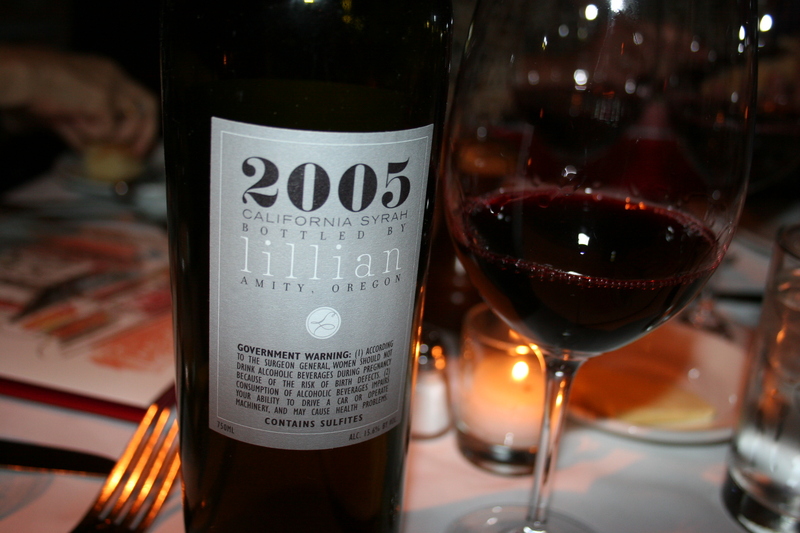 Next is the 2003 Highlands, Howell Mountain Cabernet. I don’t think I ever had anything from Howell Mt. that wasn’t top notch and the streak continues. I’d give this one a solid 92. The 2005 Clare Luce Abbey Estate Cab was a 100%cab, nothing added and it was intense with soft tannins and another long finish. Once again, I’d give this one a 92. Breaking the cab chain, we had the 2000 Jim Barry “The McCrae Wood”, Clare Vally, Shiraz. 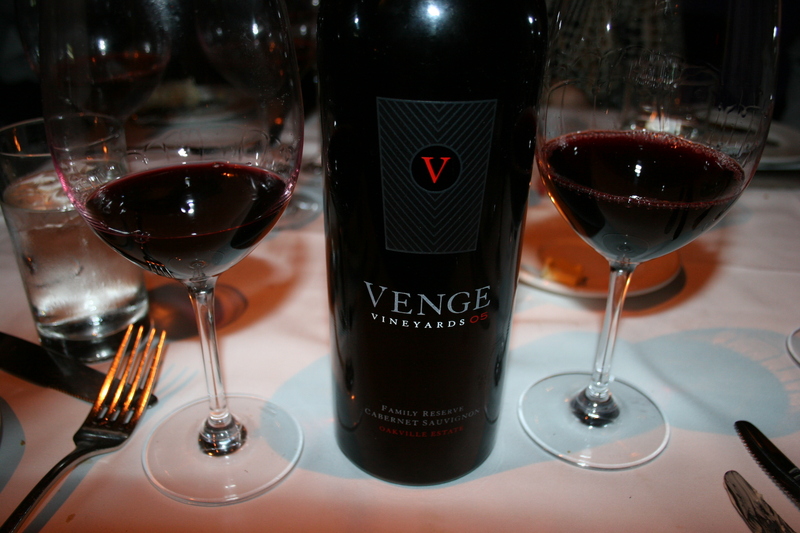 This was another heavy hitter from Oz that all of us enjoyed. This checked in with another 92. 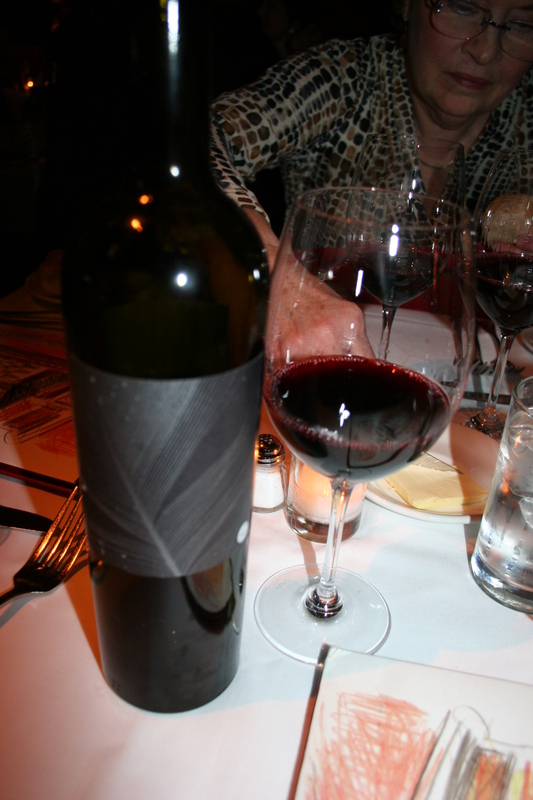 Our final wine of the evening was an old favorite, the 1999 Chappalet Cabernet Sauvignon. 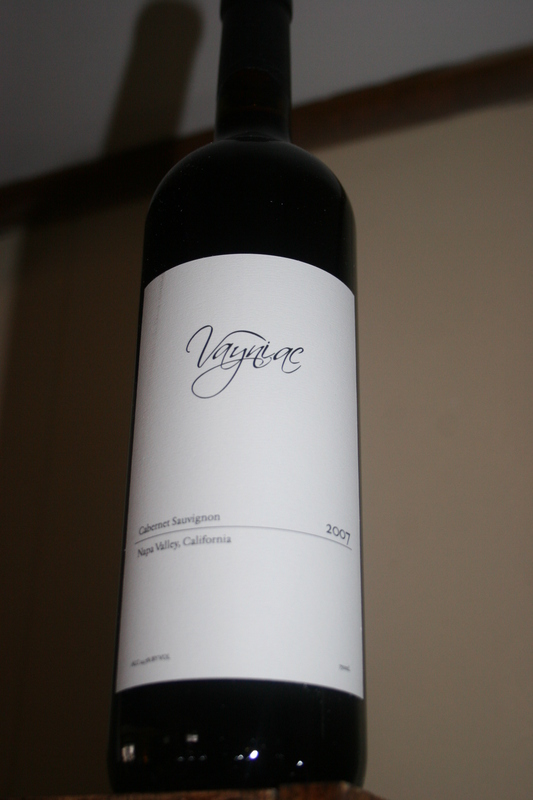 So much flavor present in this Napa cab that we had to give it a 94 and declare it the wine of the night. This was no small honor amongst the prestigious crowd in which it reigned. We capped the night off back outside with cigars and chat which always prompts a good-natured disagreement among those of us who share different political and philosophical views. Tonights debate seemed to be focused on………..ahhhhhh, you don’t need to know that. The Spring Mill Cafe was a good choice for our evening of food and wine.